The modern technology keeps evolving on a daily basis and keeps bringing new and innovative things to the table, especially when there are two major competitors on the scene. AMD has been manufacturing revolutionary chips for quite a while now, and they are definitely not afraid to come up with new solutions for everyday problems most people are facing. The AMD Infinity fabric is an architecture that facilitates data transmission across all linked components. Now, if this definition sounds too complex for you, the simplified version of it is – The infinity fabric is a true successor of AMD’s obsolete HyperTransport technology. Without going into very specific details, we can construct a comprehensive guide to why this technology is important for the performance of existing as well as upcoming chips. Basically, this particular technology helps with tying different pieces together whether it’s data links in AMD APUs or linking different CPU cores together more efficiently than before. At this moment it’s featured on AMD’s lates AM4 and TR4 sockets. Many people are confused by the fact that memory speed matters so much with Ryzen processors. For example, the cores in the Ryzen 7 are divided into two CCXs. For data to cross from one CCX to the other, it needs to go across something that’s called Infinity fabric. The mentioned Infinity Fabric does not operate at the same speed as your processor, but rather it operates at the same clock speeds used by your memory. By this logic, if you wish to transfer data faster from one CCX to another, you’ll need higher memory clocks. However, the main concern here is how much of an effect different memory speeds have on data transfers. It turns out judging by the benchmarks that as long as your memory can hit 2667Mhz or 2800Mhz, it should perform well in conjunction with the Infinity fabric technology. The most interesting thing here is that higher clocks than 2800MHz don’t yield significantly better results. In other words, the difference between 2800MHz and, for example, 3000+ Mhz is negligible as far as the performance, or rather, the usability of Infinity fabric goes. What does this mean for future developments? As expected, the new technology opens many doors towards performance improvements. Faster data transfer is definitely the main advantage of this particular technology, even though it’s not fully developed. Not that it isn’t fully developed per se, but there is a lot of potential that hasn’t been utilized yet, or rather, hasn’t been available for the general public. On the other hand, what we have is more than enough to cause a significant leap in performance, especially in comparison to older technologies such as AMD’s HyperTransport. The design itself consists of two parts – Scalable Data Fabric (SDF) and Scalable Control Fabric (SCF). The SCF is responsible for security and power management whereas the SDF is responsible for tying the memory and components together. By this logic, the SDF must have low latency in order to minimize the effects of inter-core data exchange. According to AMD, the SDF can scale up to 64 cores. When it comes to the difference between Intel’s Ring Bus and Infinity fabric, some things are worth pointing out. In lieu of explaining this in a very technical manner, it’s probably better that we oversimplify things in order to make it clearer to the average Joe. 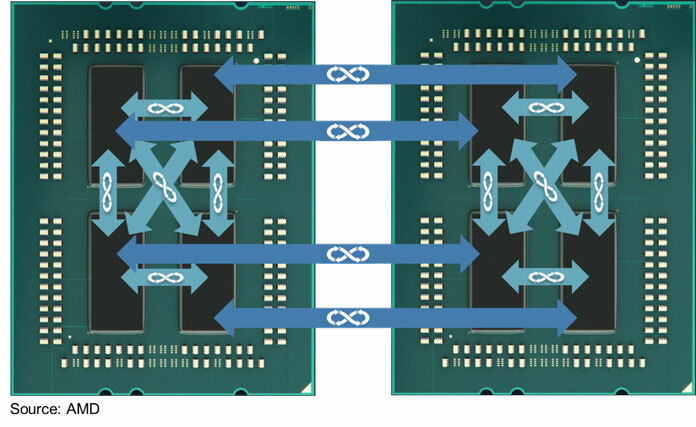 The Ring Bus technology utilizes a dual ring bus style of design in which all cores, as well as cache, are connected in a single ring so that data can travel from one core to another faster. It’s very similar to a traffic circle or a roundabout. The problem here is scaling as it is quite hard to make a bigger “roundabout” within the technology without making fundamental changes. Infinity fabric works in a similar way, but instead of data being contained within a single circle, it puts all the connected devices into a single massive block of connections. Following the aforementioned traffic analogy, we can say that this technology is more like a big intersection with a police officer in the middle controlling the traffic. As you can imagine, it’s much easier to add new roads to the existing intersection instead of building roundabouts over and over again. Therefore, the scalability issue is solved thanks to the mentioned block of connection. For example, if AMD wants to add more cores to their existing technology, they can do it without going through hassles such as building a new architecture. The design flaw here is the amount of latency between each CCX in the CPU. As we said, RAM frequency mitigates this issue, at least for now. What makes this particular concept different from Intel’s ring technology is that all cores and cache are connected to each other by a unique pathway instead of having to share/use a universal one. This makes manufacturing chips with more cores significantly cheaper to make and implement in new technologies. If you’re just a regular user, then there probably isn’t much you should worry about whether you’re on the Intel’s side or AMD’s. However, if you’re an avid enthusiast, the existence of Infinity fabric should allow you to experience better performance during heavy tasks, especially the ones that require multi threading. It’s not like it hasn’t been tested yet. Ryzen has shown a great performance as well as good stability, especially when performing tasks that cause a heavy load which thus increases the latency between chips. Judging by the current state of the IT market, we should start seeing more and more of these innovations hitting the consumers thanks to the relatively low costs of manufacturing and production. Of course, the battle between Intel and AMD is far from being over, but one cannot deny the usefulness of the said clash as it motivates both parties to work extensively on new technologies.